Some of Arizona’s most famous landmarks are found along its borders, and the Hoover Dam numbers prominently among them. Straddling the divide between AZ and Nevada, the dam is only 30 miles away from Las Vegas and sports Art Deco clock faces in different time zones—but because Nevada does daylight savings time and Arizona doesn’t, half the year the hands are aligned. Whether history or visual grandeur ranks as the more important criteria in your sightseeing plans, the dam is an indispensable visit. Bigger than any concrete structure built before its time and attracting thousands of unemployed laborers from across the country during its construction, the Hoover Dam is of considerable historical significance—if for nothing else than for the controversy that surrounded every aspect of it, from its impact on the ecosystem to the treatment of workers all the way down to naming it after an unpopular (and still-living) president. But even forget all that—it’s 726 feet tall, contains enough concrete to build a highway from coast to coast, can process 118,000 cubic feet of water per second and generates roughly a quarter of the electricity used in Arizona, Nevada and Southern California. There are two main ways to encounter Hoover Dam—you can simply cross over the top and observe the dam’s immensity from the scenic overlooks along the road, or spend the time (and money) to take one of the tours and see the works up close. 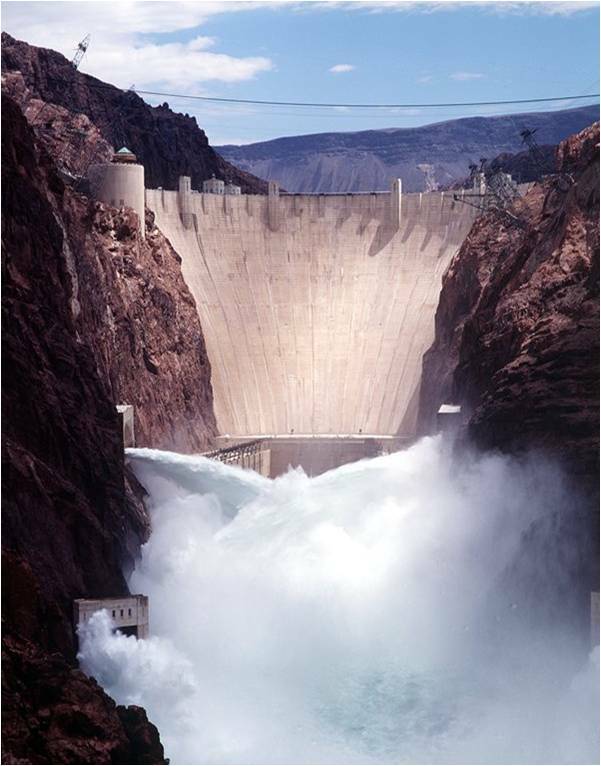 Note that since the opening of the Hoover Dam Bypass in 2010, you can’t reach the dam from the Arizona side of the Colorado River. Instead, you’ll have to take Highway 93, cross into Nevada over the Mike O’Callaghan–Pat Tillman Memorial Bridge, and then turn onto Nevada State Route 172 (a.k.a. the Hoover Dam Access Road) to access the Hoover Dam. And it’s worth knowing ahead of time that security here is pretty tight. Ever since the September 11 attacks, the risk of terrorist activity at the dam has been a constant worry, so be prepared to go through security screening as you enter the Visitor Center and stop at the inspection checkpoint if you decide to cross over the top of the dam. If you’ve got a trailer or RV you’ll have to cross, since the parking garage on the Nevada side is prohibited to oversize vehicles, but crossing is worth it for the view no matter what you’re driving. The road on the Arizona side is a dead end, but there’s multiple parking lots and dramatic views of the dam to be had, as well as the picturesque walk back across the top to the Visitor Center. At the Visitor Center you can see exhibits on the history and operation of the dam, look at the sculptures that adorn the industrial architecture, take in the panorama of Lake Meade and the river from the observation deck, or examine the spillways and intake towers with the aid of an audio presentation. Two guided tours are also available for an extra fee. The half-hour powerplant tour takes you deep underground to the dam’s inner workings, while the hour-long Hoover Dam tour adds on a mile-long exploration of the tunnels that wind through the structure. Mark Keller is a writer and filmmaker based in Los Angeles. His articles on subjects as diverse as Linux software and hammock construction are published widely online. Take an Ultralight Flight in Tucson! Hi, I'm Chris, and I'm bringing the best things to do in Arizona to you! My family lives in Arizona, and we're always traveling around the state! Check out the awesome list on our home page which highlights our favorite Arizona destinations. Enjoy! We also run a web site that specifically suggests things to do with your kids in Phoenix. Check it out and let us know what you think! © 2016 Places to See in Arizona. All rights reserved.